*SPOILERS AHEAD* If you didn’t know that this space is where episode recaps (with random bits of commentary) occur, now you do. So, if your mind’s not ready to know exactly what happened in this week’s episode of Knightfall, avert your eyes. Now. You’ve been warned. Covering his tracks, Percival unceremoniously dumps Parsifal’s body into Godfrey’s grave and – when Landry returns with the Grail – confesses that Parsifal took Roland from the Temple but plays dumb as to Parsifal’s whereabouts. Ever the fount of information, Draper updates Landry about the letter Roland wrote and signed “IV.” Landry makes the executive decision to send every knight that the Temple could spare to find Parsifal. Mistake #1. 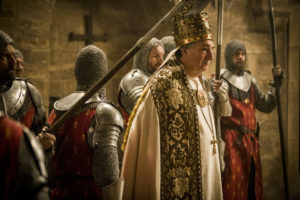 With Pope Boniface en route to the Paris Temple with a mini papal army to collect the Grail, Landry is pressured by his mother and Rashid not to trust anyone other than them and, certainly, not to give it to the Pope. But it’s them that Landry doesn’t trust, and he chooses to follow his belief that the Grail belongs with the Church. Mistake #2. Turns out that Roland was one of the Pope’s men, all of whom wear a Roman numeral on their collars. It also turns out that the Pope had Godfrey killed. Unfortunately for Landry, he realized that fact after handing the Grail over to the Pope and – after a half-hearted attempt at protest – Pope Boniface drops all semblance of innocence and makes clear his cause. He wants to use the Grail to launch a second Holy Crusade, unite all of Europe under one faith and erase the need for all rulers, save himself. 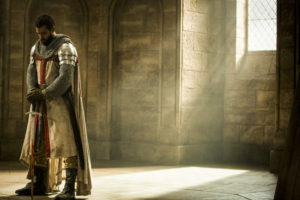 The Pope had Godfrey killed because he refused to give him the Grail and as he leaves the Temple with the Grail, Pope Boniface orders the same fate for Landry and the handful of Templar Knights that remain at his side. And just like that, the Holy Grail is gone. Again. After a small skirmish where Rashid is injured, realizing Percival is on the wrong side, barricading themselves in the Temple and a bit of chemical warfare, even though outnumbered Team Landry (including a wounded Rashid) conclude they will have to take the fight outside to the Pope’s men. Fortunately, reinforcements eventually arrive in the form of the Brotherhood of Light and their newest member, Tancrede. Percival (good riddance) and Rashid fall but, with his last breath, Rashid apologizes to Landry for letting him believe Tancrede was dead. While cousins Queen Joan and (ice) Queen Elena face off in Navarre with a war brewing, a message from King Philip arrives declaring that he isn’t sending troops after all and commanding Joan to capitulate to Catalonia and return to Paris immediately, giving Elena the upper hand in snark and tactical advantage while further diminishing Joan’s standing among the people of Navarre. But what Elena wants is far more than Joan humbled and conquest over her country: Elena wants blood. 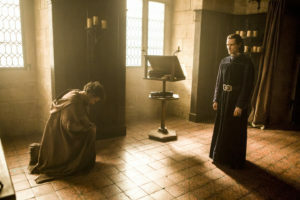 Literal blood as payback for Princess Isabella’s role in the death of her son, Prince Lluis (she knows), in the form of killing Isabella or the child in Joan’s womb. Elena isn’t picky: either child will do. When the moment of decision comes, Joan appeals to a dagger-wielding Elena’s motherly grief causing Elena’s heart to break wide open as she collapses in Joan’s arms. It’s a moment of pure sympathy and empathy: mother to mother, family, blood. It’s also a moment Joan decides to neutralize any possible future threat to her, her children and Navarre by killing Elena with her own dagger. Just because De Nogaret is a wanted man with the king’s guard on his tail, doesn’t mean that he’s lost his single-minded devotion to securing King Philip’s throne … or, rather, his single-minded devotion to bringing down the Templars. The two objectives seem to run parallel and – while his true motivation for accomplishing them is still obscure – his determination, not so much. That’s obvious by the risk he takes in having Nicholas sneak him into the castle to see Philip in order to re-plead his case against the Templars, announce that the Grail is in Paris and – oh yeah – your best friend, Landry, is sleeping with your wife, Joan. That last bit is a semi-bombshell to Philip; he resists it, but his relationship doubts have him halfway believing it. Also, De Nogaret has amassed an army of mercenary Red Knights to take on Landry/the Templars for Philip…they just need Philip’s financial support. Done. Now that we know who the “big bad” is, it sets Landry and the Templars on a collision course with the one thing most sacred to them as individual men and a holy order: their faith in God. As God’s representative on earth, the Pope is behaving badly which – in its most simple interpretation – has God behaving badly. Killing Godfrey may be the starkest example of such, but the Pope’s want for power, to have not only spiritual but also secular dominion over men and the willingness to spill untold amounts of blood to achieve it are what the Templars must reckon with. War and destruction embarked upon as a method to amass or consolidate power? Some themes truly are timeless. Welcome back, Tancrede. He looks good in black. Queen Joan was quite fashionable strategically representing both halves of her whole in a dress bearing the coat of arms for France’s House of Capet and the kingdom of Navarre. Landry’s “Another f*cking secret? Seriously?”- eye roll when Rashid died: priceless.